Roofing Contractor Colorado Springs: We Can Work With Your Insurance Company! Our Colorado Springs Roofers Can Work With Your Insurance Company! If you have discovered hail damage to your Colorado Springs home, you’re not alone — 2018 was one of the worst storm seasons on record with at least three large wind and hail events. In fact, the June 13 storm that hit Fountain and the surrounding area caused an estimated $169 million dollars in damage, making it our region’s second-costliest storm. 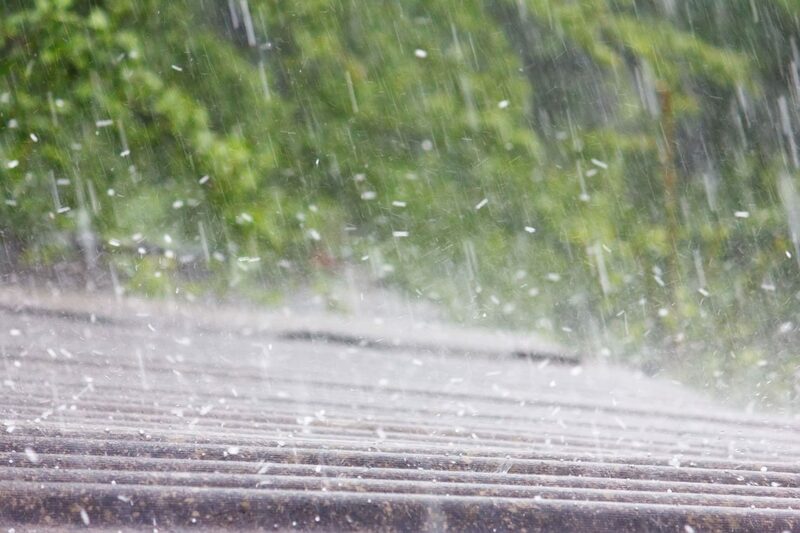 Chances are your roof, siding, and gutters have some kind of damage from these storms, and that is where Go2 Contracting can help. 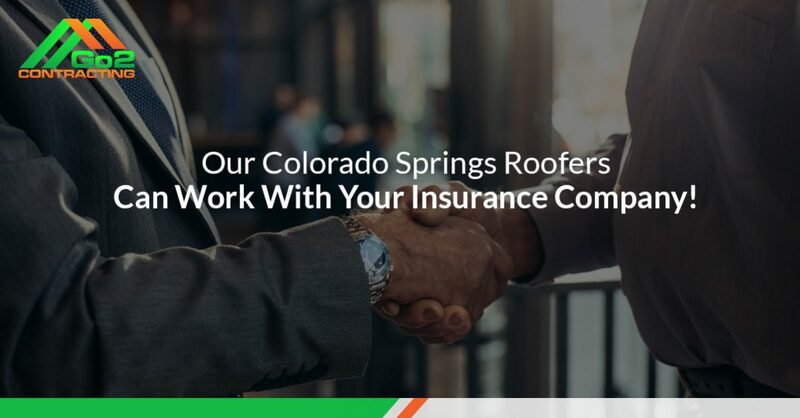 Our Colorado Springs roofers have the skill and experience needed to repair or replace your roof, and we can make the insurance process easier on you. Winter may be upon us, but that doesn’t mean it’s too late to get roof work done. Contact us today for a free quote! You might wonder if you should call your homeowner’s insurance company following a major storm. This can be a difficult decision to make for a couple of reasons. If you file a claim, you run the risk of increased insurance rates or cancellation in the future If you have damage and don’t file a claim, your insurance company may have a hard time separating out storm damage from wear and tear down the road. Getting your roof inspected by a professional roofer can help you determine if it has storm damage and how bad the damage is. This can help you determine whether or not you want to file a claim with insurance. If you decide to file a claim for storm damage to your roof, there are many ways our team can help. Check them out below! In order to consider payment on your claim, your insurance company will require a detailed estimate. This is because they want to know details such as what type of shingle we’ll be using, how much waste we’ve factored in, and our labor rate. Our team believes in full transparency, and we are happy to complete an itemized estimate so your insurance company knows exactly what work we are proposing and how much we’ll charge to do it. During the course of a wind or hail damage claim, your insurance company may need to clarify the details of your roof’s damage. They may also have questions about the estimate that we wrote. While some other local roofing contractors might consider those phone calls your responsibility, Go2 Contracting is happy to speak with your insurance company on your behalf because we believe that open communication is essential to a proper and efficient roof job. From time to time, it is possible that additional work is needed beyond that which was included in our initial estimate. For example, we may have written an estimate for a roof repair before determining that a replacement is more cost effective, or we may discover additional damage that needs to be addressed for a proper repair. In the event that supplemental estimates are written, or if your insurance company’s estimate is different from ours, we will work with them to reconcile any differences. Some Colorado Springs roofers only specialize in repairing and replacing roofs. This doesn’t mean they won’t do a good job on your roof, but if you also have damage to your siding or gutters, you’ll have to hire additional contractors to repair or replace these items. At Go2 Contracting, we are happy to address all exterior storm damage to your home, from your roof and siding to the gutters, alleviating the need to coordinate repair work among different contractors. Do you need a reliable team of Colorado Springs roofers to restore beauty and functionality to your roof following a hail or wind storm? Look no further than Go2 Contracting. Our team can repair or replace your roof quickly, and we will work with your insurance company to ensure a streamlined claim process. From providing you with a free initial quote to reconciling any differences with your insurance company, you can count on us to do the job right. Contact our team to learn more about our gutter, siding, and roof replacement services!